Oil product stocks in the Middle East's key oil hub of Fujairah fell 4.4% to a nine-week low in the week to May 14 after rising summer demand for power generation saw a sharp draw in heavy distillate stocks. Total oil product stocks in Fujairah fell 802,000 b/d to 17.45 million barrels, according to data from the Fujairah Energy Data Committee, or FEDCom. Stocks of heavy distillates and residues were down 12.8% week on week to a new a six-week low of 7.87 million barrels, the data showed. Bunker demand in Fujairah has been mostly positive in recent days, even as crude prices continue to surge. Fuel oil supply in the region is expected to tighten over the next few months as summer power generation demand rises, Platts Analytics said in a report Wednesday. Situated on the Eastern coast of the UAE's Arabian Peninsula, Fujairah is the world's second largest bunkering port and has seen a rapid rise to prominence as a hub for trading, storage and bunkering of regional, and increasingly global, significance. Middle Eastern countries typically increase fuel oil consumption during June-July due to higher demand for power generation. Saudi Arabia was historically a fuel oil exporter but is now a major importer during the summer months. One trader said the kingdom is likely to import around 400,000-500,000 mt of fuel oil in June. Pakistan State Oil also continued to be active, this week purchasing 60,000 mt of LSFO and 210,000 mt of HSFO for June delivery to Port Qasim, the report said. 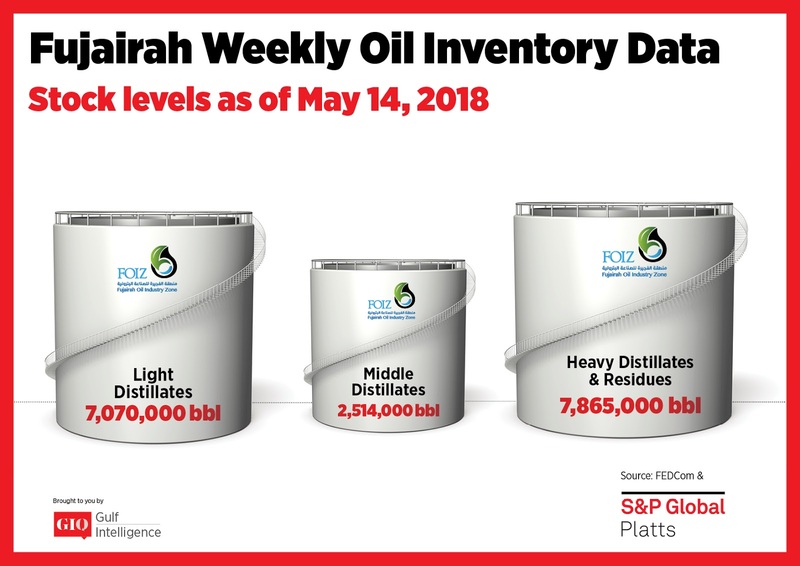 Meanwhile, stocks of light distillates rose 1.8% on the week to 7.07 million barrels, despite a pickup in gasoline demand across the Middle East and Asia in the run-up to Ramadan. Kuwait, Qatar, Jordan, Pakistan, Indonesia and Sri Lanka have been buying actively in the spot gasoline market. Premiums for Arab Gulf RON 95 gasoline continued to edge upwards, pegged at a four-month high of $3.05/b Tuesday, the report said. Stocks of middle distillates also rose by 9.8% to 2.51 million barrels. Although this was a five-week high, the stocks were unlikely to move out of recent ranges due to largely balanced supply fundamentals. Refinery maintenance was reducing, but gasoil demand in the Middle East was rising as summer approached. Gasoil arbitrage to Europe was limited with the front-month June EFS at minus $7.68/mt Tuesday -- well above the levels around minus $15/mt that typically see gasoil move from the East of Suez. Arbitrage conditions are more favorable for jet fuel, as traders continued to expect demand in Northwest Europe to pull in barrels from the Middle East and West Coast India. According to Platts trade flow software cFlow, some 1.5 million mt of jet fuel will arrive in Northwest Europe from the East of Suez in May. 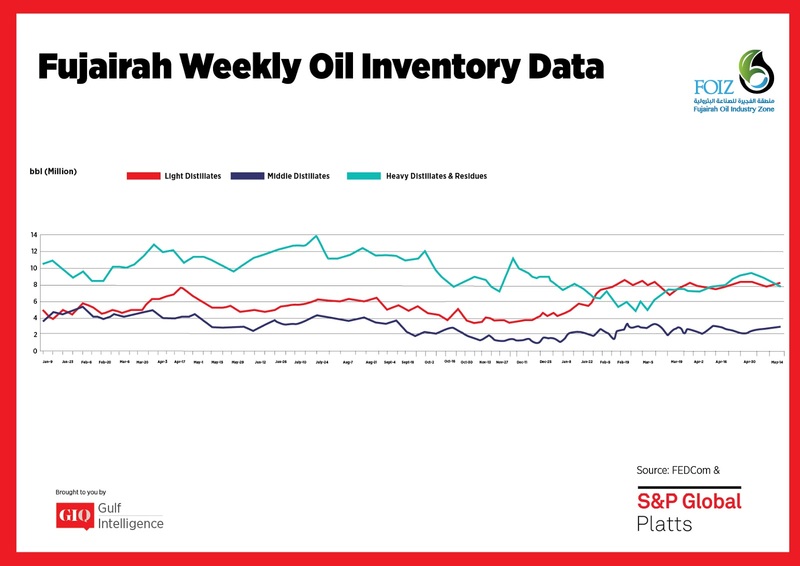 S&P Global Platts holds exclusive rights to publish Fujairah oil inventory data and has deployed a Blockchain network for its collation.